Details relating to the Portuguese Commemorative of 2013. 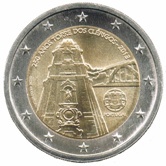 This coin commemorates the 250th anniversary of the completion of the bell tower of the Clérigos church. The tower is 76 meters tall and the highest church tower in Portugal. It dominates the city of Porto and has become the symbol of the city. In earlier times it served as an orientation point for ships. The tower is shown in the inner circle of the coin in the perspective as seen from the street. Next to the tower one sees the impressive Dom Louis Bridge, connecting Porto to Vila Nova de Gaia, across the Douro river. In an arc across the top of the inner circle is the inscription: ”250 ANOS TORRE DOS CLÉRIGOS – 2013”. At four o’clock is the name of the issuing country and between nine and eight o’clock we see the mint mark and the name of the designer – Hugo Marciel. From Portuguese Commemorative 2013 to euro coin collector.